Mini Staplers provide a handy portable solution for keeping documents in order while on the move. Designed for light duty usage, mini staplers or pocket staplers have a stapling capacity of between 10 and 18 sheets of 80 gsm paper. Contoured, modern and sleek ergonomic design with a soft feel plastic handle for comfortable use. 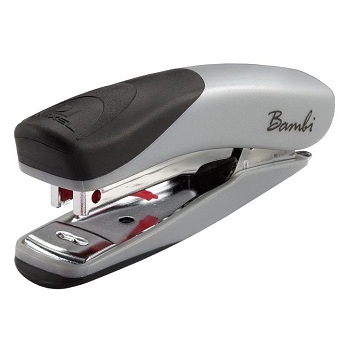 Mini Stapler. Capacity - 10 sheets. Uses No.25 staples. BONUS Box of 1,500 staples included. 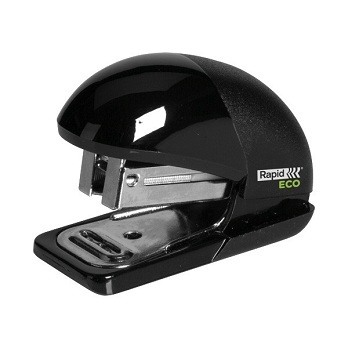 Rapid Eco Mini stapler is developed with sustainability in mind. Its compact size makes it extremely handy and can follow you wherever you go. Manufactured from 80% recycled plastic with soy-based printing and is packed in recycled cardboard.